Research evidence concerning the precursors (a sign or symptom that heralds another) and prodromes (an early or premonitory symptom of a disease) of the various mental disorders is growing but is at present widely dispersed and inaccessible. Clinicians have to rely on their own experience, which is often limited, when faced with several delicate diagnostic and treatment issues. This book aims to approach for the first time in a comprehensive way this emerging area of clinical psychiatry. The World Health Organisation has found that mental disorders such as depression and psychosis rank in the top 10 of leading causes of disability in the world, creating a significant social, emotional and economic burden for young people, their families and society. Early detection of these potentially disabling disorders and treatment at the time of initial onset can greatly improve long-term outcomes and effect dramatic cost-savings. The related Birchwood title has sold nearly 2300 copies and is popular at psychiatry conferences. From an R&D perspective, industry have a stake in this area. Obviously, if biomarkers or other prodromal evidence can be determined in various disorders, then drugs will start to be dispensed earlier. The topic has increased in popularity as a subject for satellite symposia e.g Jeffrey Lieberman chaired the Bristol Myers Squibb symposia at the American Psychiatric Association. This dealt with early intervention in schizophrenia and the need for novel approaches in the prodromal phase. In addition, more symposia (and research) look at disorders "across the lifespan." This phrase indicates an approach to research, diagnosis and treatment from a more quality-of-life vantage and early diagnosis is part of this movement. Mario Maj, University of Naples, Italy. Juan José López-Ibor, Complutense University of Madrid, Spain. Norman Sartorius, University of Geneva, Switzerland. Mitsumoto Sato, Tohuko University School of Medicine, Sendai, Japan. Ahmed Okasha, Ain Shams University, Cairo, Egypt. Prodromal Symptoms and Early Detection of Schizophrenia (Hafner and Maurer). The Management of Early Psychosis (McGorry et al). Children of Persons with Schizophrenia: An Overview of Empirical Research (Mirsky and Elliott). Detection and Management of Bipolar Disorder in Children and Adolescents (Weller et al). Detecting the Risk for Affective Spectrum Disorders in the Children of Bipolar Parents (Masi et al). The "Difficult" Child: Main Underlying Syndromes and Differential Diagnosis (Tyano and Manor). Precursors, Prodromes and Early Detection of Eating Disorders (Casper). 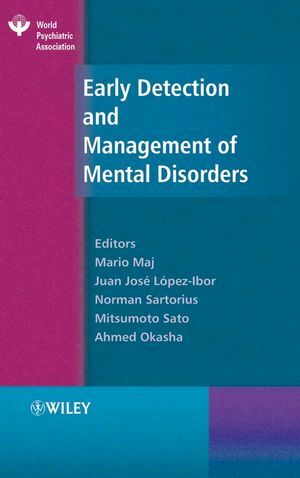 Precursors, Early Detection and Prevention of Anxiety Disorders (Stein et al). Early Recognition and Management of Depression in Primary Care (Tylee and Walters). The Prodromes and Early Detection of Alzheimer's Disease (Zaudig).